It was Valentine’s day yesterday and we hope you had a wonderful time with your loved ones! Did you make our Valentine’s Orzo with Black Truffle Sauce? If not, go ahead, it’s simple, delicious and between us, it doesn’t have to be Valentine’s day to enjoy something like this! 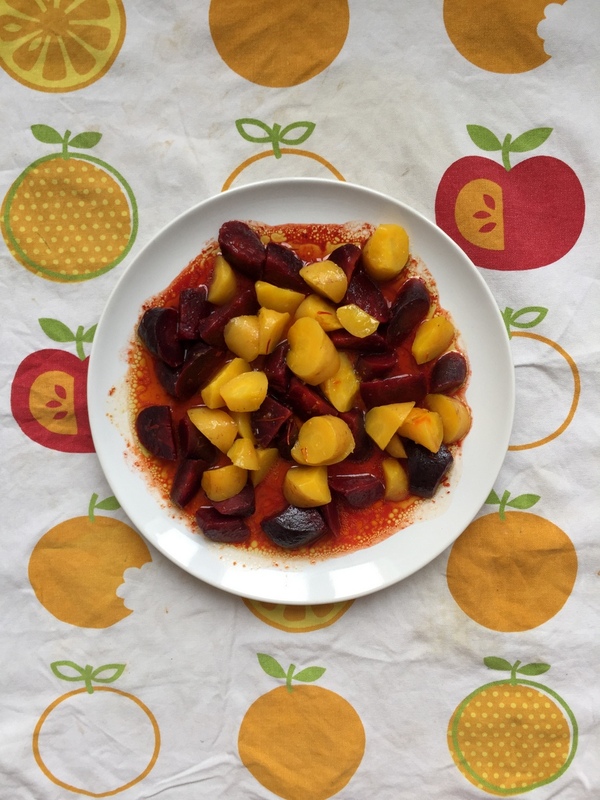 This week we have a new recipe using one of our products of the month: saffron! Remember our Saffron and Orange Chickpeas from a few weeks ago? If you haven’t used this unique ingredient before, this week’s recipe is ideal. And I must say, do have a look at our beautiful hamper for the adventurous cook. It includes saffron amongst other intriguing ingredients that guarantee to inspire your daily cooking! Or check our gift bag with saffron and other treats! 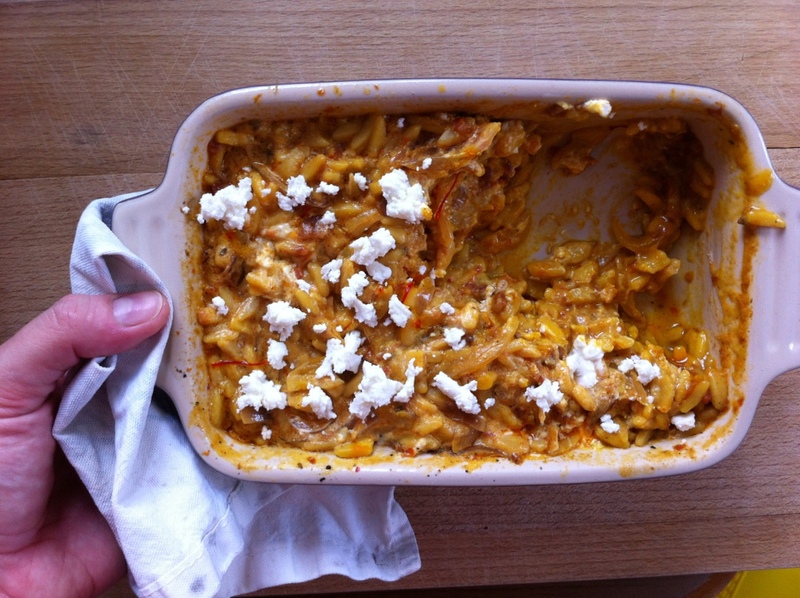 This recipe is adapted from the Greek magazine Gastronomos, one of our favourite ones. It is on the sour side, so if you prefer your dressings sweeter don’t hesitate to add a bit of honey or grape molasses. Cooking after all is all about adapting recipes to your own unique preferences! Wash, peel and cut your carrots in bite-sized pieces. Place them in a large pot with boiling, salted water and boil until tender. Remove from the pot and drain. You can skip this step if you prefer and use the carrots raw. In the meantime, make your dressing. In a bowl whisk together the lemon juice, orange juice, red wine vinegar, saffron in water and garlic. Slowly add the olive oil, until the mixture is emulsified. Taste and season with salt and pepper. Toss warm (or raw!) carrots and dressing together and serve immediately. 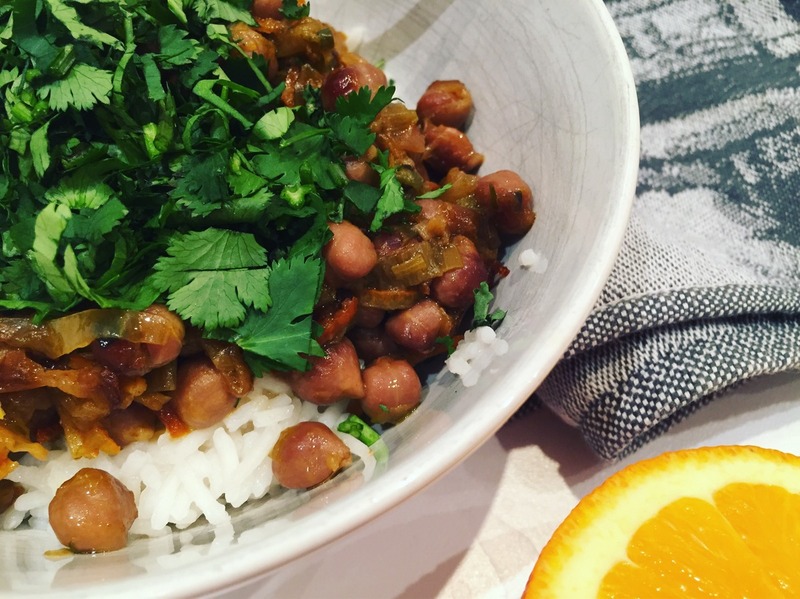 A few months back, we saw that our lovely Amarylis had made chickpeas with orange, using our olives and capers. What a wonderful combination of flavours, I thought at the time! So when thinking of this week’s recipe, and with all the citrus fruit around, this idea came to mind. Chickpeas and orange! And as winter makes us all feel really cold, we thought of adding something different to our chickpeas. Saffron! 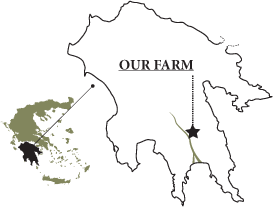 Our organic Greek Saffron comes from the Kozani Cooperative in Northern Greece. It has a unique floral flavour and aroma, while it gives an exquisite amber colour to many dishes, desserts and beverages. Including our chickpeas! Oh and did we mention it has antioxidant properties amongst other things? Here’s the recipe and check out our hamper for the Adventurous Cook, that includes saffron! The night before, soak your chickpeas. The morning after, boil the chickpeas in plenty of water, until soft. Finely slice the leek and chop the onion. In an oven proof casserole, heat fry your leek and onion in the olive oil until transluscent and slightly caramelised. Remove from the heat and add the chickpeas, orange juice and zest, saffron, smoked paprika, salt and honey. Stir well and place in the oven. Bake for an hour to an hour and a half, until the flavours have blended, adding a bit more water if needed. Serve with rice or Greek yogurt, fresh herbs and more honey if you desire. Luxury is quite a complex word. When it comes to cooking, it’s usually associated with expensive or rare ingredients. Something most of us don’t usually incorporate in our daily cooking routines. But you know, expensive can be relative when it comes to food. And luxury doesn’t have to be something we save for special occasions. We can add small notes of it in our daily cooking. I’ll explain. How? Well, all one has to do really is source some good ingredients and combine them in clever ways. And most of these luxury foods go a long way. Saffron is the ingredient we love today. Why? Because of its red, gold colour. Because of its warm, slightly metallic flavour. Because a few threads are enough to add its unique aroma to your food. Plus, it makes us feel luxurious, doesn’t it? The one we are using is from Greece and oh, it’s organic too! This recipe is inspired by Jamie Oliver’s flavour combinations. Boil your water and add the saffron threads. Once they release their colour, add the sun dried tomato paste and stir. Pop in the cardamom pods. Finely chop the onions and gently fry them with the olive oil until translucent. Use a heat-proof casserole over medium low-heat. Add the orzo and stir, until the grains are coated in oil. Pour the saffron/sun dried tomato liquid over the orzo. Season with salt and pepper. Transfer your casserole to the oven and bake, stirring occasionally, until orzo is cooked and liquid is absorbed, around 20-30 min. Check halfway through and add a bit more water if needed. A few minutes before your orzo is ready, add the galomizithra cheese and fold through so that some lumps remain. Bake for another 10 minutes, until the cheese melts. Can you smell the red-gold luxury? This dish is great served with a simple green salad. 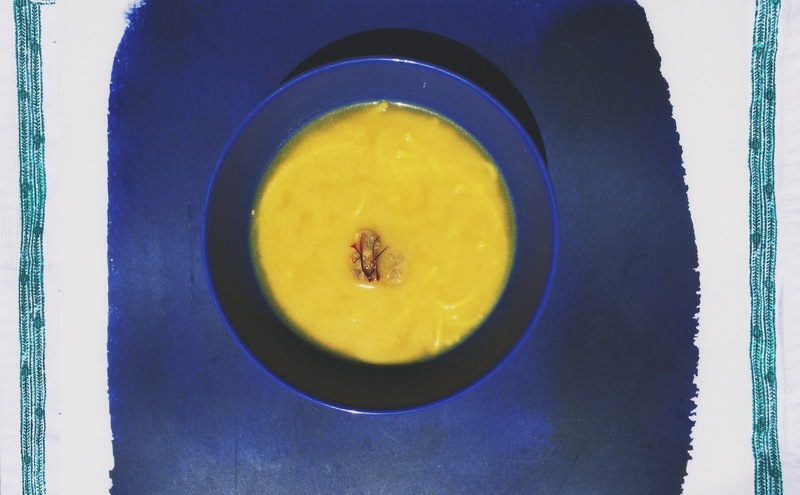 Further to our research project: “Fides –beyond the chicken soup” we developed this comforting and delicious soup. Combining the excellent antioxidant properties of saffron with mineral-rich tahini bring us to a special soup that you can use as a starter or as a meat free Monday meal. It’s great if you’re fasting too –the main inspiration for this soup is frugal Monastery cooking. We are preparing a special blogpost introducing you this brilliant cuisine, stay tuned! Break fides with your fingers, in smaller pieces. Boil it in salted water. Remove it from fire. Mix tahini in small bowl and set aside. Add saffron and lemon. In the small bowl with tahini, add a few spoonfuls of hot soup broth and mix well. Add this back to the soup and stir to incorporate completely. Stir well and boil it for a couple of minutes. Serve it and sprinkle with sesame seeds. If you feel like going large with your toppings: garnish with grated lemon zest, sesame seeds and chopped scallions. Don’t forget paximadia! Did you enjoy the saffron-tahini combination? You can always use it as a salad dressing. We love it with green salads, especially with roasted sweet potatoes or butternut squash. Soften the saffron in 2 tablespoons of boiling water, and let it cool. Put into a bowl with the tahini and lemon juice and whisk to a creamy consistency. Check the seasonings. 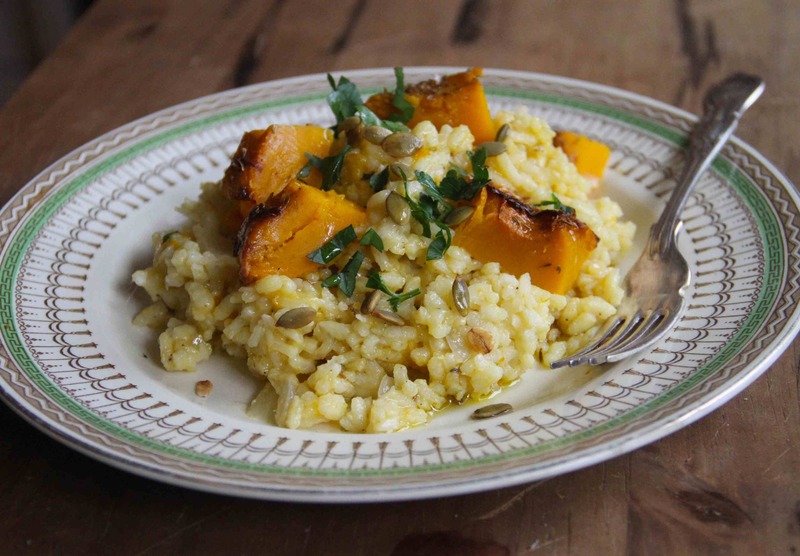 Pumpkin risotto with sage and saffron is lovely healthy recipe that could be a side or a main course.